375 in stock Need More ? Committed to high performance? This pack of six 2-in-1 day planners/journals will guide you through strategizing the next 12 months of your life. 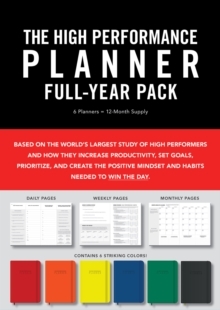 Based on the world's largest study of how high performers increase productivity, set goals, prioritize projects, outperform their peers, and create the positive mindset and habits needed to win the day, The High Performance Planner includes morning mindset journal prompts, daily goal boxes, evening scorecards, weekly habit assessments, monthly project planning, and proprietary whole life balance sheets. Best-selling author and world-leading high performance coach Brendon Burchard designed the Planner to help you think more strategically, prioritize like a pro, achieve your goals faster, and become more focused, happy, and productive. Best of all, the Planner helps you install the personal and professional habits proven to lead to long-term success. Brendon says, "High performance means succeeding over the long term without compromising your health or positive relationships." This Planner helps you do that by accounting for your entire life's progress, not just your daily to-dos. The six planners in the Full-Year Pack come in a variety of colors, which are also all available for individual sale: Red (978-1-4019-5732-2), Orange (978-1-4019-5734-6), Yellow (978-1-4019-5733-9), Blue (978-1-4019-5736-0), Green (978-1-4019-5735-3), and the original Black (978-1-4019-5723-0).